Armour is the basic defense an entity has against threats. Armour can be found in both air and ground vehicles in War Thunder and plays a very important role to the vehicle's survivability. Armour on aircraft are often minimum and focused on vital sections rather than on the overall air frame. Armour are often not taken into consideration in the design as armour constitutes more material and thus a heavier aircraft which would inhibit its performance due to weight penalty. Armour for pilots are thus usually never beyond the usage of bullet-resistant glass on the cockpit that could provide protection against rifle calibre ammunition. Though some armour plating are present in the back on some planes like the P-47, these were only thick enough for small calibers and serve more to slow down the incoming round so that it has little energy once it punches through. Other important areas that armour could be present on aircraft is around the engine. Important design features that dictate whether an aircraft design is more durable than others was in the air frame build quality, the air frame's ability to take damage, and adequate protections around vital components such as the engine, pilot, and fuel tanks. Armour plays a very important role on tanks as they were conceived by it. The armour on the tanks at its inception made them invulnerable to the basic small arms fire, a trait that broke the stalemate of the trench warfare in World War I. During the interwar period, tank armour was prioritized on protection against firearms and artillery shrapnel. However, experience in the Spanish Civil War showed that this concept leaves the tank vulnerable to heavier guns. This is demonstrated when Italian tankettes and German Panzer I's, armed with only machine guns and simple 13 mm armour, went up against the Soviet T-26, which had a 45 mm gun on its turret. The tank arms race increased armament and armour, evident on the German Panzer IV when armour increased from the initial 14.5 mm in 1936 to 30 mm in 1938 before World War II broke out. During World War II, tank armour played a huge part in tank design. More armour means more weight on the tank and thus must be sparingly used to the tank mobility in acceptable margins. Tank armour in this period is separated by the three tank categories, light, medium, and heavy tanks. It was in this period that tank armour went through many technological advances. One of the perfect example is the French SOMUA S35 and the Soviet T-34. The two vehicles made extensive usage of the concept of "sloped armour", which increased the armour effective thickness due to the difference in the line-of-sight thickness (See "Concepts" section). The Germans, which mainly used vertical-faced armour on their Panzers, struggled to take these vehicles out due to their strong armour against their inadequate guns. While the Battle of France did not incite Germany to quickly upgrade their armour and armament due to the small quantities of these kinds of tanks, the encounter with the T-34's in Operation Barbarossa came as a great shock due to the large number of T-34's available in Soviet inventory. The Germans, in a stage informally known as a "tank panic", rushed development to complete weapons able to destroy the T-34 and uparmour their tanks to withstand the Soviet 76 mm cannons. The Soviet T-34 and American M4 Shermans caused great headaches in the German armoured forces due to their strong, sloped front armour in 1942, but that all changed in 1943 and beyond. The year 1943 changed everything in the balance of tank power from the Allies with their T-34 and Shermans to the Germans. Germany introduced their newest tanks in large quantities, the Panther and the Tiger I tanks. These vehicles introduced powerful cannons and a new redefinition of the term "armour" for tanks. The Tiger I came with an astounding 100 mm armour thickness in front. Though vertical-faced and thus did not have the benefit of "sloped armour", the guns on Shermans and T-34 at the time could not penetrate the front plate at standard combat ranges, forcing the Allied medium tanks to close in for a kill. The Panther had 80 mm of frontal armour, but that armour was sloped at a 55° from vertical and caused the effective armour to instead be 140 mm thick. Thus, the Panther was basically invulnerable in the hull front from any anti-tank weapon in existent in Allied inventory. The Germans also started to extensively used an armour called Schürzen, which is a form of "spaced armour" that provided additional protection to their tank's weak side armour. The two new tanks, plus a new one in the form of the Tiger II with 150 mm of frontal armour sloped for effective thickness of ~230 mm, caused turmoil in the Allied armoured forces as they find a way to easily destroy the new tanks. They were never able to compete against the German's in terms of armour thickness until after World War II. By the end of World War II, sloping armour had become a ubiquitous concept and every tank designed has it from the American M60, British Centurion, and Soviet T-54/55 tanks. With increasing tank armour equaling to increased weight, countries try to keep their tank weight in manageable ranges while making the armour up to date with current threats. By early 1960s, anti-tank technology such as the anti-tank guided missiles (ATGM) has grown to the point where it requires a large amount of steel to make the armour thick enough to resist the threat, but the amount was prohibitive and made the tank too heavy. Some nations such as Germany tried to solve this by relying on mobility at the expense of armour such as the Leopard I, but it became clear a new type of armour is needed. It came in the form of "composite armour", which used steel combined with a variety of material such as plastic and ceramic that can resist penetration more effectively at a lighter weight. Composite armour soon became the new standard of tank armour throughout the world. Another armour developed in the Cold War was the "explosive reactive armour", which used an explosive to deflect a penetration property. Explosive reactive armour, or ERA, was highly effective against the ubiquitous HEATFS rounds used as anti-tank weapons. These armour technology saved the tanks from becoming obsolete during the Cold War against the new anti-tank missile threat that allows a small infantry crew to destroy a tank as far as 2000 meters away. Composite armour, ERA, and the increasing lethality of tank armament helped revolutionize the tank concept from light, medium, and heavy tanks into the new, universal "main battle tank". A cut-out of a T-54 to show the effectiveness of sloping armour. Sloped armour is effectively angling the armour of a tank on an angle rather than placed for a flat surface. Slope armour presents the advantage of having a much thicker effective armour on a tanks for a lighter weight due to using a thinner armour plate. The sloped nature also increases the chance of the impacting shell to simply ricochet or deflect off, doing no effect to the armour. The disadvantage of the sloped armour was its more complicated manufacturing process and a reduction in internal space. Note: This formula does not factor in the possible horizontal or vertical angle of the target's armor plate relative to the shot's origin or deviations of the shell's angle of inclination due to bullet drop at longer ranges. We assume the target is placed on an even field and shot at from straight ahead at distance where the shell will hit the armor with 0° of bullet drop. Thus, we get the value of how thick the Panther's sloped frontal armour is in a line-of-sight angle. Outside of sloped armour, another way to improve the effective armour thickness on tanks is simply angling the armour towards the opponent. This means instead of sloping the armour in a vertical plane, instead angle sideways. An example of armour angling with the Tiger I, angled towards the opponent in its most optimum degree for best all-around armour. This gives another form of thickness as not only does the round have to pass through a plane of armour, but two plane of the same armour, which would boost the effective thickness. This is best seen in vertical-faced armoured tanks like the Tiger I tank. Though their vertical faced 100 mm front plate would only give 100 mm effectiveness, it was recommended in the Tigerfibel crew manual that a 45 degree diamond angle position would provide a front armour of nearly 130 mm of effective thickness. This gives tank a chance to improve their effective front armour thickness especially when against enemies that would penetrate their front with little difficulty. However, beware of angling to much towards the enemy that it exposes the weaker side armour to enemy fire, which may have a chance of penetrating. Some tanks attempt to implement this concept into the designs itself. One example is the Soviet IS-3 with its "pike nose" front armour. 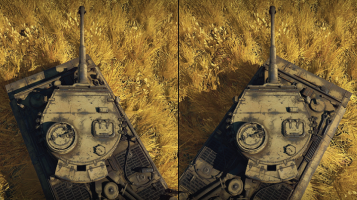 Due to the sloping effect not only going back, but sweeping to the sides, this improves the IS-3 front armour effectiveness and ricochet chances. Spaced armour helps against anti-tank rounds in a form of disruption and denial. Spaced armour was first widely used by the Germans in the form of Schürzen, attaching metal sheets away from the base armour of their Panzers. These metal sheets were intended to disrupt the kinetic energy of the Soviet 14.5 mm anti-tank rifles, which could penetrate the weaker side armour of their tanks. 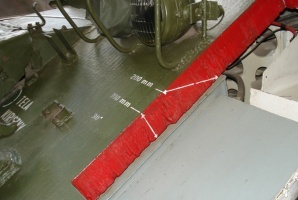 It does this by forcing much of the energy on the rifle round to be expelled on the Schürzen sheets, passing through and causing negligible damage on the base side armour. The Schürzen may also disrupt tank rounds as well, but the much greater kinetic energy of tank shells means that its disruption will be ineffective to all but the most sloped shots. Though there is a belief that the schürzen plates were meant to stop HEAT rounds from shoulder-launched weapons, the plates were not intentionally designed for this task. Spaced armour was used in various formats in the Cold War tank designs. It was used as a form of protection against HEAT rounds from tank guns and rocket launchers, with the air separating the tank's base armour and the spaced armour acting to dissipate the HEAT's power before it reaches the hull. Spaced armour also works against kinetic penetrators by shattering the round on impact with the first layer. Though early kinetic rounds using brittle materials like tungsten were affected by this armour, better material like depleted uranium made the rounds more durable and proof against this type of armour. Explosie reactive armour (ERA) works by using an explosive force to disrupt an incoming armour-piercing ammunition. The construction of ERA usually takes the form of individual tiles made up of "reactive elements", which are sandwiched explosives in between sheets of metal. These tiles would be used around vulnerable points of a tank to provide protection at these locations. Though ERA provides good protection against HEAT ammunition, high-velocity kinetic penetrators like APDS and APFSDS penetrates too quickly for the explosive force to be effective against them. This was a problem in early ERA designs, but more modern ERA types have been able to resist these ammunition. Even so, ERA still has drawbacks in that each explosive tile were one-time use against the incoming round, leaving the exposed tank metal underneath once expended. ERA also has become vulnerable to tandem-charge ammunition, which use a two-stage detonation sequence with the first charge destroying the ERA plate and the second penetrating the armour underneath the plate. Finally, the ERA plates rarely cover the entire tank sections due to contouring and moving parts, so the armour is still exposed in various degrees to be hit and penetrated. The first efforts in discovering this form of protection reach back to 1949 in the Soviet Union at the Nii Stali facility, although nothing much came out of it after failed tests and it was discontinued on the belief that the current armour on their main battle tanks was good enough. The traction did not continue again until German researcher Dr.Manfred Held, a shaped charge (HEAT) specialist, traveled to Israel on the conclusion of their 1967 Six-Day War. Examining several of the destroyed tanks from the conflict, he discovered that the force from exploding ammunition slightly reduced the effect of the shaped charge used. He then developed the first working ERA plate in 1970. Though this was the first effective iteration of the ERA, Held's design required the explosive mesh to be fitted inside empty cavities, integrated into the tank armour. Held improved on the design in the same year which consisted of a tiles formed with the reactive elements. This model would become the fundamental design of modern ERA. The majority of the NATO countries did not buy into the explosive reactive armour that Held presented. He did not find anyone interested until he returned back to Israel in 1974, after the 1973 Yom-Kippur War. There, the Israeli government and the Israeli Defense Force were persuaded, perhaps from their combat experiences, to adopt the ERA as a protection for their tanks. The Israelis then produced the Blazer ERA plates which followed Held's design with reactive elements. The Blazer ERA will first see usage in the 1982 Lebanon War, the tiles attached onto M60 tanks to protect the steel hull against anti-tank weaponry. The Soviet Union was the next country to use ERA, under the name Kontakt ERA. It was first introduced in 1984 and featured a tile design similar to Blazers, though using one or two reactive elements stacked together for better effectiveness. Like the Blazer, these plates were highly effective against HEAT rounds, but were generally ineffective against kinetic penetrators. Following the Soviets, the reactive armour was soon adopted by many other countries in the 1980s, from mainly Eastern bloc countries such as Czechoslovakia, Ukraine, and Poland. Today the ERA plates are still viable against modern anti-tank weaponry, especially when complemented with other tank defensive measures. Add-on armour is a form of improvisation of the tank armour usually done by the crew or a maintenance unit in the front lines. Due to the rushed nature of tank technology in World War II, armour once considered adequate on tanks can quickly become obsolete with the introduction of a new gun piece in the field or a new equipment, such as the KwK 36 (88 mm) on the Tiger I and the Panzerfaust anti-tank launcher, both could cut through Sherman and T-34 armour with little resistance. The declining armour effectiveness against these weapons prompted the tank crews to attempt an expedient method to improve the armour quality of their tanks. Troops went and attached logs, sand bags, tracks, concrete, and metal sheets onto their tanks to improve its effective thickness. The usefulness against anti-tank rounds from tank shells and HEAT rounds are controversial. Some tankers swear by it and claim they were saved by their improvised armour while analysts say that the add-on armour has no effect at all in interfering with incoming rounds. What was universally accepted was that these add-on armour helped improve the tank crew morale when fighting the enemy, renewed in confidence with their "improved" tank armour. However, add-on armour increases the weight of the tank due to the add-on of materials and thus can cause a strain on the power train and suspension of tanks, prompting some commanders like General George S. Patton to ban the usage of improvised armour to improve tank reliability. The most useful add-on armour was the welding of additional sheets of metal onto the tank, as seen in the well-received reception of the up-armoured M4 Sherman in the form of the "Jumbos". From Update 1.57, a modification known as the Add-on Armour was added onto certain vehicles. The modification adds spare track links along the hull and turret of the vehicle. The track links, when added, give an average of 17 - 20 mm of additional armour where they are attached. Bismarck. "⚜ | Yes, World War 2 Planes Had Armour BUT..." YouTube. YouTube, 17 Aug. 2017. Web. 26 Sept. 2017. Video. Carruthers, Bob. Tiger I: Official Wartime Crew Manual (the Tigerfibel). Warwickshire: Coda, 2011. Print. M.m. "Explosive Reactive Armor - Some History, Some Types." Below The Turret Ring. Blogger, 28 Apr. 2016. Web. 25 Sept. 2017. Website. M.m. "The Truth about Spaced Armor on Modern Tanks and AFVs." Below The Turret Ring. Blogger, 31 Dec. 2015. Web. 26 Sept. 2017. Website. This page was last edited on 17 February 2019, at 22:31.